In 1990, Alpha Denshi (ADK) and Visco unsheathe their own top-view racing games. Far from lacking originality (...), the two firms offer an interesting alternative: getting away from the overseen F1 championships, they now take place with the World Rally Championship! Thrash Rally and Drift Out use no official license, but who cares! Parsche, Toyoto and other Sabaru tumble with strength. Earthy and skidding tracks are waiting for you, so prepare for some manly action. Facing the Neo Geo, Visco aligns a 68k-based absolutely similar to its rival: Motorola 68000 at 12Mhz, Z-80 at 4Mhz, even the Yamaha YM-2610 to 8Mhz of the SNK machine is used. A chipset is added to handle image distortions like rotations. Resolution is identical for these games, 320x224, with the difference that Drift Out uses a vertical screen, 224x320 therefore more accurately. Right from the first glance, one notices that Thrash Rally displays a much higher amount of colors , double or even triple of what offers Drift Out. 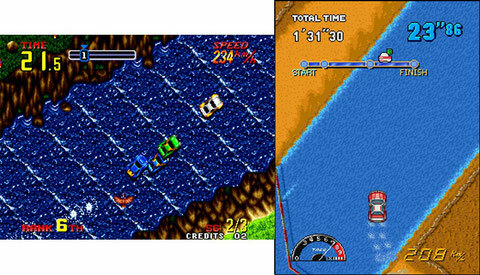 Without being ugly, this one features few environments not enough detailed and relatively linear, in that those are almost the same from the beginning to the end of a race. The cars are all about the same, with only colors and one or two details that might change. Alpha game is more rich and varied in its backgrounds, and the lower sides of the road are often very well drawn and do not miss details. Its bolides are more varied than the competitor, and it even proposes trucks, buggies and motorcycles, not to mention the spectators, and other animals on the roadside. 1-0! Views used are stricly the same in both apps, by cons scrollings are happening radically differently. You remind about mode 7 of the Super NES, or even simply F-1 Grand Prix in arcades? The same rotation method is applied for Visco's game. 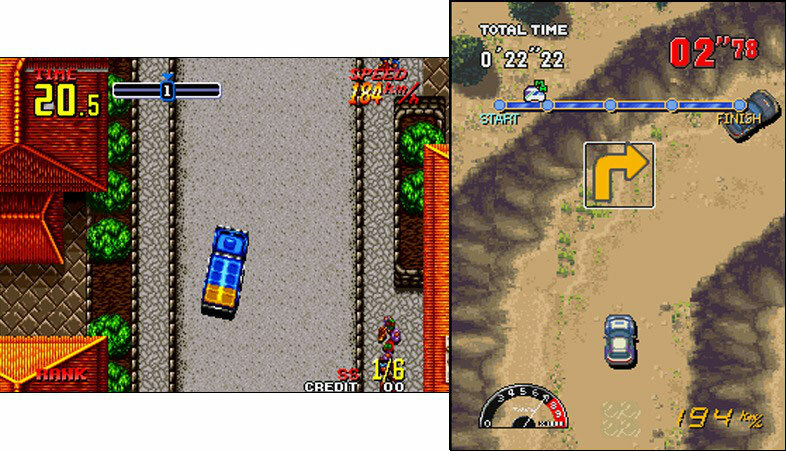 Roughly speaking, this is not the car but the background that moves around it, so that the front of the vehicle is always oriented towards the top of the screen. Thrash Rally uses a multi-scrolling and thus shows appears slightly different from Drift Out. 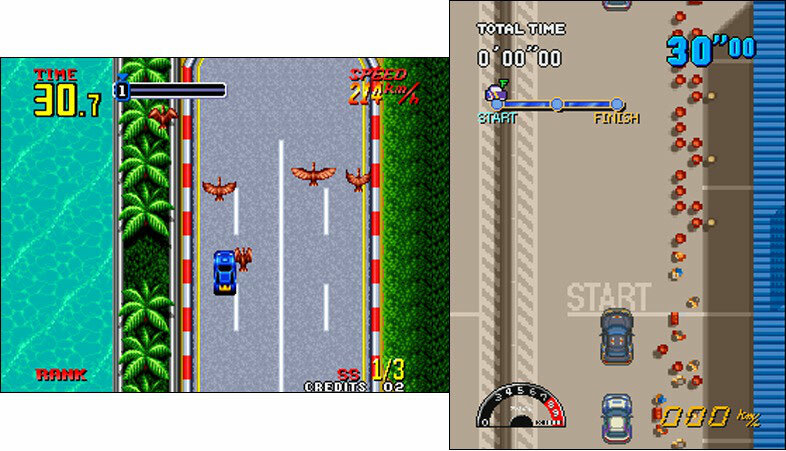 The car can turn in all directions following the road that turns all around the screen, with scrollingq merely following it. In both cases, the scrollings are fast enough and provide a good feeling of speed. ADK uses zooms for its game and a lot of living details in its backgrounds, such as helicopters or aircraft passing over our heads, or bales of hay, animals or pedestrians that can topple even on roadsides. The skids are also better realized in it. 2-0! Thrash Rally does not shine by the realism of the sound of engines, screeching tires and other sounds of racing... The whole is average, but it has the merit of not assaulting the eardrums either. The music contribute to the atmosphere: varied, catchy but unobtrusive. When we come to Drift Out, we regret bitterly the poor Thrash Rally soundtrack. Even to the point of mute, as it is unbearable. Oh yes, the musics are not bad, each rally has its own theme and if it's far from good, it is at least harmless. No, the real problem is the engine sounds. Or should I say THE ONLY engine sound. Because all cars have the same, you are entitled to a sort of Renault V10 (very badly digitized) as punishment everywhere you'll go in the game. Yes, you have read properly, we are driving Rally cars equipped with F-1 engines. And I can tell you you're at the first rank for appreciating this. WHAT YOU SAY??? No sorry, I'm still a bit deaf after a game of Drift Out. This 'noise' therefore covers all other sounds and music, standing as the major part of the soundtrack. If you liked the Fuego F1 scene in 'Mais qui a tué Pamela Rose', you'll love Visco's soft. Icing on the cake, engine RPM due to changes in speed almost never match the noise heard: 3-0. There's a total of six races for Drift Out, quite short but extremely difficult... because of the gameplay. There's seven vehicles with different characteristics (handling, acceleration, top speed, braking...) that you will discover by having accid... uh, doing races. For the six events of the game (Lombardy, Kenya, Greece, Sweden, Thousand Lakes, Monte Carlo) good luck to overcome and most importantly, be at the top of the rankings! This is still a fairly short and this is what the app offers. Thrash Rally allows the player to choose between entering a WRC competition like Drift Out, and also a Paris-Dakar race where you run against the clock as well. It's a kind of 'giant' stage available offline championship. 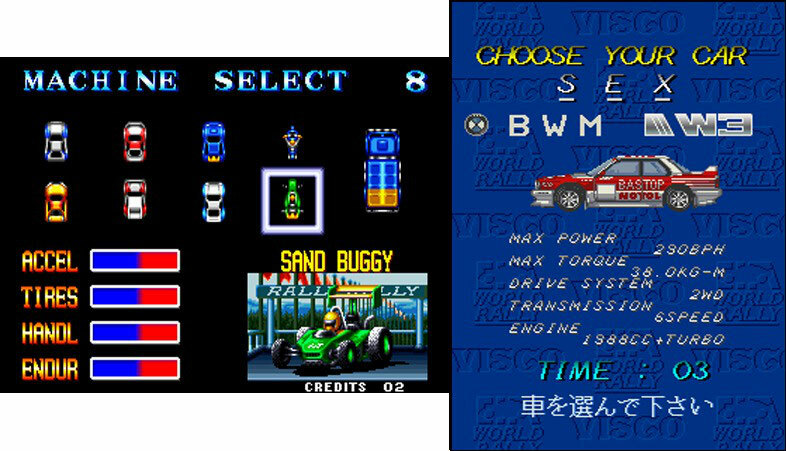 Ten vehicles are selectable, and in addition to traditional racing cars, you can drive a buggy, a motorbike and even a truck. Championship reduces this number to six, with only cars. In this competition offering six destinations (Grenoble, Kenya, Greece, Thousand Lakes, England, Speciale Paris-Dakar) you have to reach checkpoints in the allotted time, each race consisting of three to six. Thrash Rally is longer and also offers a more balanced challenge. 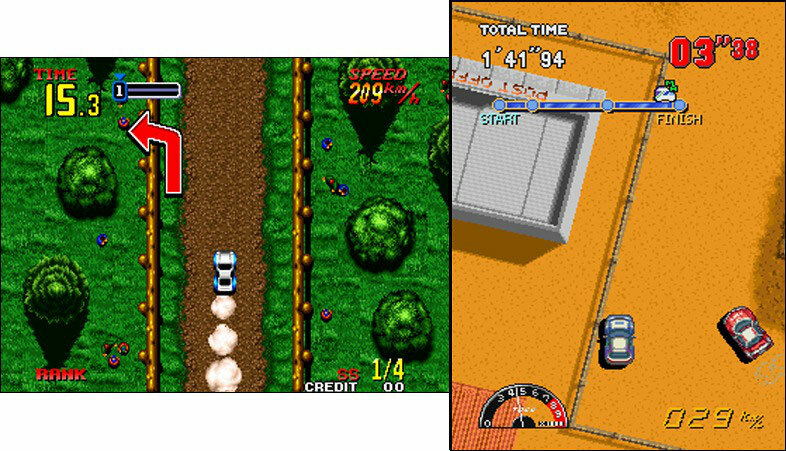 Incidentally, Thrash Rally can be played two simultaneously with link cable. The game is not a benchmark about handling, as its controls requires a little time for players to adapt. As Riding Hero, turning works by 'notches' on the stick: that's not hyper realistic neither comfortable, but it's quite precise and we accustomate to it finally. You can either drive using the best trajectories or drift all the way if you wish to. There are many different possibilities and styles with the different vehicles available. The race against the clock is becoming harder and harder as you advance in the game, and it requires some precision. Training will be necessary! Now, let's try to remind you of the most unfair games that you played. Well, Drift Out outperforms all these without a problem. Collisions tests are staggering: the mere fact of touching a thicket stops dead your vehicle and brush against a guardrail have you head to tail. The slightest contact with a rival car is stopping the vehicle, while it exceeds you cheerfully. Pleasant, eh? Wait, that's not all: curves are not always announced: oh well, it's so much funnier like this! And even better, a shift announced to 90 ° is sometimes a 180 °. Visco guys, you were such jokers! The thing is that when it's time to put a coin in the machine or a note for the gameplay, there is less inclination to laugh. 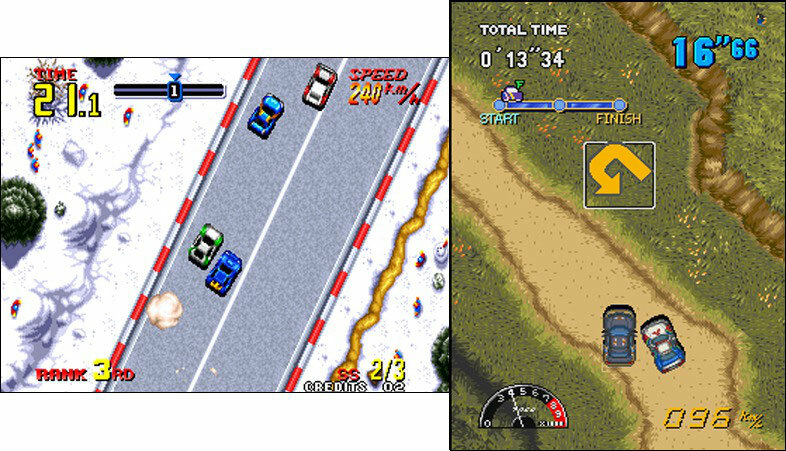 If Neo Drift Out is one of the best 2D arcade racing games, its ancestor Drift Out will clearly not be remembered by any player, and this is when trying it that one understands why. There's no pleasure in driving, the game is inaccurate, collisions sometimes unavoidable and to top it off, the engine noise is unbearable. Thrash Rally has no trouble dealing with this piteous competitor: its realization and controls are far better, not to mention its higher life. A supreme victory!